I have been wanting to make one of these badge albums for some time...you use name badges (purchased here), and they make the cutest little scrapbook pages. I decided to purchase a quick page kit to make the process a whole lot faster (just drop and drag your photos into the psd document). Since I wanted to make Sharon a little something to remember her graduation...I decided to make one for her first. It went together pretty quickly. To prepare for printing I made a 4x6 (new) document in Photoshop and put two completed pages onto that document (each digi page page measures approx 2.5x3.5 so you can fit 2 on one 4x6 print) and uploaded them to Costco (who does awesome photo printing!!! ), or print from your printer. Since my name badges were a little bigger than my photo pages, I just cut some cardstock 3x4 inches and adhered the photo page to it and then just slid it into the name badge~easy peasy. I am excited to give it to her when I see her on Saturday (she is in Italy with her family this week~LUCKY DOG!). Feel free to email or leave me a comment if you have any questions on how to make one. Regardless of our political views...today we remember that our FREEDOM is NOT FREE!!! 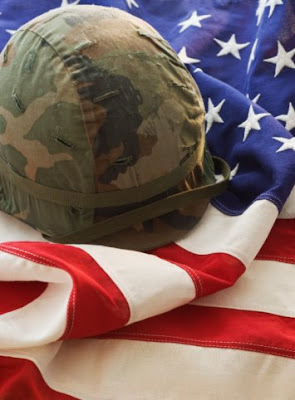 Thank you to our service men and women for keeping us safe and free!!!!! I am looking forward to a very long weekend...I took a few days off next week and don't have to be back to work until Thursday...lots of projects planned (including my ever growing ironing pike...*sigh*). Have a safe holiday weekend!!! Thanks for visiting! I am getting excited for a long weekend!!!! Don't you just love those? I particularly like having Monday off...it is so wonderful to sleep in on Mondays, ahhhh! Here is a card I made a while ago. I found it in my card basket and really liked the layout...so I decided to post it. 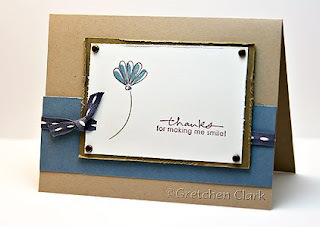 I think I may use this stamp set and layout to make some more of these in different colors. 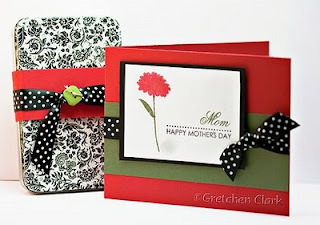 I just love easy cards!!! I am still plugging away at my photography course...and I highly recommend it if you want to learn how to shoot manual and take better pictures. Karen explains things in terms the average person can understand!!! I am sort of sad that I only have 3 weeks left (even if I am a few assignments behind). I had a few moments to stamp yesterday (*happy face*), and have been wanting to use my PTI Aqua Mist and Lemon Tart together...I like the combo (really soft). I pulled out my Floral Frenzy set (one of my fav's) and came up with this card. Ashley signed up for this...and I have to say it is pretty cool (she came over to show me some of the features). I am not sure if I can be that discipline...but I am gonna give it a try (since I am too busy with work, church and my class to make it to the meetings). I have become so lax over the past few months...but it is time to whip into shape (it is amazing the motivation you get when you start thinking about bathing suits...blah!). Happy Day!!! That is a perfect title for a Friday...don't ya think?? 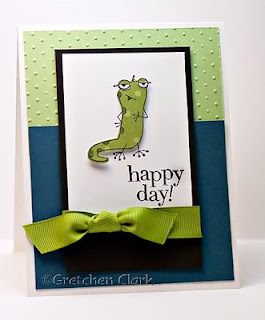 Here is the card I made Josh for his birthday...I used my INKADINKADO Humorous birthday stamp set and paper pieced this little gecko guy (not to be confused with Geico, LOL! I crack myself up sometimes). Do you have any fun plans for the weekend?? Not sure what we will be doing, but the weekend is always great, IMO! Do you ever feel like you can never get caught up with life??? I have been so busy with work, my photography class, and everyday life...I sometimes feel like I am like a hamster in a wheel!!! We celebrated a birthday at work on Monday, and I needed a masculine card (always a struggle for me!). I really like this image from the INKADINKADO (Humorous Birthday set). 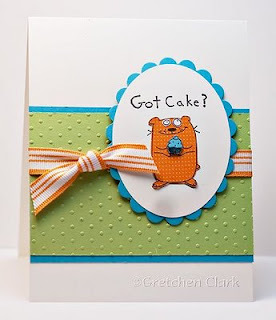 This little guy looks so cute paper pieced. I also popped the cupcake up with a glue dot. Too cute!! Another new week is ahead of us...are you ready? I hope you had a great weekend...and a Happy Mother's Day. We celebrated Josh's 20th birthday on Mother's Day, so the fam was all here (a great way to spend MD...IMO~even if I cooked Josh's choice for lunch). 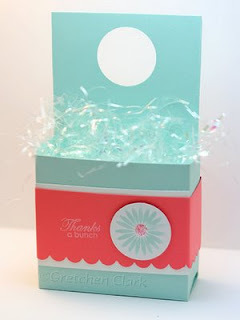 Here is the little ensemble I made for my mom and my MIL for Mother's Day...I found this cute gift card tin at Michael's, and just jazzed it up a bit with some matching cardstock, ribbon and button. I used my PTI Life and Women of Life stamp sets for the card. It all came together pretty quickly. Yes...the weekend is finally here...yeah!! Here is my last digi post this week. 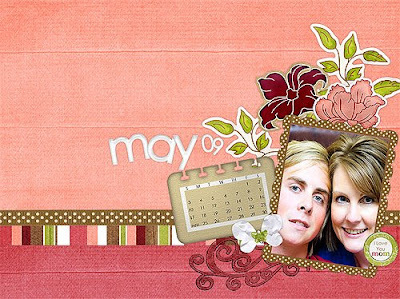 Since Mother's Day is this Sunday I thought I would post my digi desktop (highlighting the mother's day kit and a picture of me and Josh, who's birthday is right near/on Mother's Day). You can grab one here for free. I really love the colors and elements from this kit...so of course I ended up buying it, LOL! I told Ashley and Josh that for Mother's Day I wanted a photo shoot with the two of them...I realized that I don't have any recent pictures of them together...we will see how that photo shoot goes...maybe I will even get to scrap with my new kit. We are celebrating Josh's 20th birthday this weekend (5/9)...I cannot believe that my favorite son is no longer a teenager~*gasp*!!!!! 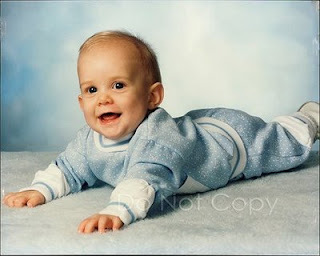 I am just glad that I am not aging*wink* Here is a picture of the cutie. Enjoy today and have an Awesome weekend!!! Hope you are having a great week so far...we are almost to the weekend!! 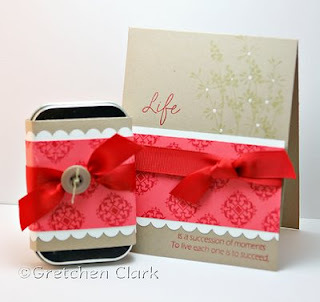 In honor of National Scrapbooking Day (which was 5/2), I am going to post some digi pages this week. Here is a page I made of Mike and I (silly us!!!). I found this new digi store that I really love, and since so many of the stores are having sales this week in honor of NSD, I got some major deals (love, love, LOVE a sale!!!!). 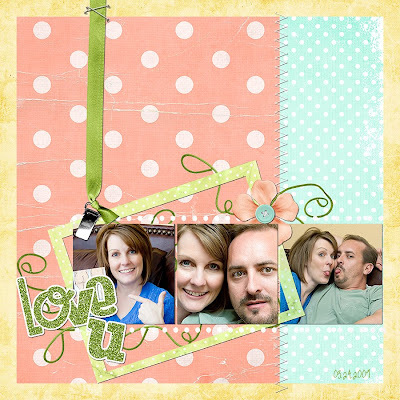 I have to say digital scrapbooking has changed the way I scrap, and I don't think I will ever go back to paper scrapping...just because you can use your paper and elements over and over again (perfect for a product hoarder like myself, LOL!). 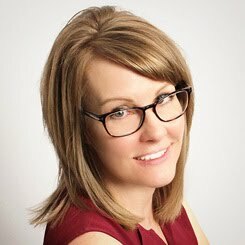 And Jessica Sprague is offering some free online classes to get you started if you are interested in learning digital or hybrid scrapping...check it out here. She is an awesome teacher and if you like the freebie classes...the paid classes ROCK!!!! I have taken all of them and learned so much from her, they are worth every penny!! Sorry but it is gonna be another quick post today...I have been so busy this week with my class, work, regular stuff. My step dad's birthday was yesterday. I have been calling him "Grouch" for a few years now, he isn't always grouchy, LOL! But occasionally he is...and I don't let him get away with it! I really cannot remember when it started, but it is kind of a joke between the two of us...he calls me Grouch-ette. 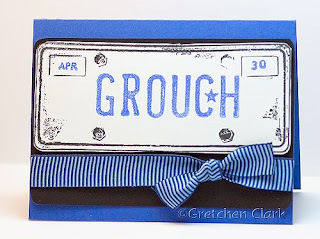 I recently purchased this stamp set (Licence Plate by Stampology) at Michael's, and immediately knew I was going to personalize a card for Grouch. He called me to let me know he got a kick out of the card...SCORE!! !